Toyota describes the 2019 Toyota 86 as a “Purist’s Dream,” touting all of the racing features you could possibly want from a new car. Well, they’re definitely not wrong with their assessment. The powerful engines help to back up this sentiment, as do the various mechanical inclusions. If you’re looking for a fun sports car for your next purchase, then there’s truly no better choice. However, the 2019 Toyota 86 shouldn’t only appeal to those seeking a racer. Rather, the brand did an admirable job of equipping the nameplate with a number of additional amenities, all leading to a unique sports-car driving experience that can be used any day of the week. Sure, you’re probably opting for the 2019 Toyota 86 because of its unmatched sportiness, but the brand’s engineers still did an admirable job of including a number of technological amenities inside of the vehicle. Thanks to these inclusions, drivers can remain entertained throughout their journey, and the improved convenience will only help to improve the driving experience. For starters, the vehicle comes standard with the brand’s seven-inch touchscreen display. This inclusion will provide the driver with a personal concierge, meaning owners can have access to an assortment of useful applications. For instance, the navigation system (which includes voice recognition) will guide drivers to those harder-to-find destinations, leading to the utmost convenience. Meanwhile, the owner can opt to equip the system with Aha, which provides them with more than 100,000 radio stations. There are even applications like Yelp and TripAdvisor, which will be particularly useful when you’re traveling long distances. That way, whether you need to find a hotel, some coffee, or a place to eat, your touchscreen system will be by your side. This unit also includes Bluetooth compatibility, making it easier than ever to connect your smartphone to the system. Thanks to this inclusion, drivers can complete hands-free phone calls, allowing them to stay connected without compromising safety. The system includes a number of additional amenities, as well, including streaming, HD Radio, and iPod compatibility. Plus, thanks to the AUX/USB inputs, you can always connect your gadgets while keeping them charged. If you decide to listen to any of your favorite radio stations, playlists or podcasts then you’ll also appreciate the eight-speaker Pioneer audio system. This unit provides occupants with an intense, unmatched listening experience, allowing you to fully jam out while you’re cruising down the open road. The technological functions don’t end there. The brand also added a number of functions that will come in handy throughout any driving experience. The center-mounted tachometer displays an assortment of useful information right in front of the driver, while the analog (and sporty) speedometer provides a second place for you to monitor your speed. Sure, we’d bet you were expecting the 2019 Toyota 86 to solely deliver incredible performance. While the nameplate certainly does that, it also manages to impress thanks to the array of technological inclusions. When you’re behind the wheel of such a racer, we’re sure you’re focused on maintaining control and remaining safe. Fortunately, the Toyota 86 carries on the brand’s tradition of engineering some of the safest vehicles on the road. The 2019 Toyota 86’s safety functions mostly revolve around the brand’s renowned STAR Safety System, which allows drivers to stay safe throughout any journey. Inclusions like the Anti-lock Brake System, Brake Assist, and Electronic Brake Force Distribution will provide drivers with an optimal amount of stoppage power, while the Traction Control system means you can overcome any type of road conditions. The safety inclusions don’t stop there. The Vehicle Stability Control assures that you’ll always have optimal control over your sporty ride, and the Smart Stop Technology will assure that drivers are maintaining a safe and logical speed. If you find yourself in an accident, there’s no need to worry. A number of features will assure that all occupants will remain safe and secure. The extensive airbag system (including the advanced driver and front passenger dual-stage advanced airbags) will provide everyone with the necessary amount of cushion during a crash, while the standard Lower Anchors and Tethers for Children (LATCH) assure that your youngest occupants are staying secured to their seats. You may be a bit wary of your ability to control the 2019 Toyota 86. While engineers assured that drivers will always have the utmost handling of their sport vehicle, that didn’t stop them from adding a number of safety functions to the ride. 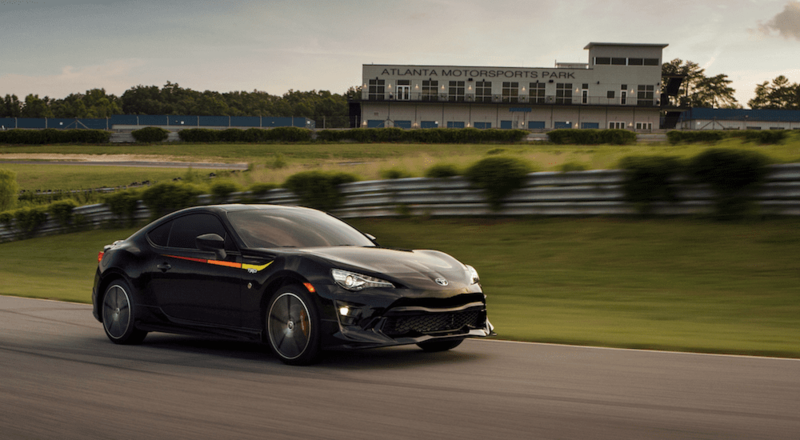 The 2019 Toyota 86 is one of the sportiest vehicles in the industry, and a major reason for this sentiment has to do with the vehicle’s incredible, unique design. While you’ll surely be enticed by the nameplate’s cosmetics, the exterior is a whole lot more than a pretty face. Rather, drivers will also be impressed with all of the exterior amenities that will improve the driving experience. For instance, the inclusion of LED projected-beam headlights assures that you’ll always be noticed (of course, it will also provide optimal visibility), while the heated mirrors will be especially appreciated on those freezing cold mornings. The chrome-tipped dual exhaust will add that air of sportiness to your car, and the 17-inch twisted spoke alloy wheels will serve as the perfect cherry on top when it comes to the athleticism. Toyota clearly wasn’t focused on solely producing a capable racer. Rather, they wanted owners to show off their new purchase, and you’ll be more than willing to display everything the 2019 Toyota 86 has to offer once you make a purchase. Yea, yea, we know… this article is touting how the 2019 Toyota 86 should be known for more than performance. Still, we couldn’t possibly write about the nameplate without mentioning how sporty the nameplate actually is. Ultimately drivers will have access to the incredible 2.0-liter aluminum Boxer engine, which allows drivers to take advantage of a whole lot of power. The system is ultimately capable of delivering an impressive 205 horsepower and 156 pound-feet of torque on the manual-transmission version, and it pumps out 200 horsepower and 151 pound-feet of torque on the automatic transmission variation. Incredibly, these systems also manage to be relatively fuel efficient. The 2.0-liter Boxer engine promises up to a 32-mile-per-gallon highway fuel efficiency and a 24-mile-per-gallon city fuel efficiency on the automatic-transmission variation. Thanks to these numbers, drivers will have the opportunity to save some extra cash at the gas station. Of course, the vehicle includes a number of additional mechanical features that will also help to boost performance. For instance, those previously-mentioned transmissions allow drivers to find the configuration that best fits their wants and needs. The six-speed manual transmission will provide an unmatched ability to stay in control, while the innovative six-speed Electronically Controlled automatic transmission provides an easy, enjoyable driving experience. Meanwhile, the 17 x 7-in. alloy wheels will be ready to roll, with the accompanying 215/45R17 summer performance or all-season tires ready to overcome any type of road conditions. When you consider all of these amenities in combination with each other, you’ll understand why you should be expecting an optimal driving experience. Regardless of what you were looking for in the 2019 Toyota 86 this vehicle provides something for everyone and probably more than they were expecting. Categorizing it as a just another racer does a disservice to all the other amazing features that come with this vehicle and detracts from a driving experience that most anyone will appreciate.